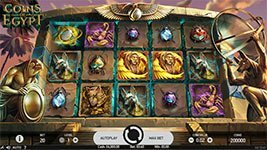 Discover rich forgotten treasure of ancient Egypt in Netent's newest video slot, Coins of Egypt! This exciting 20-line game takes you to a temple which hides the coins and fortunes within its reels. Spin for your chance to unlock big rewards with wilds, free spins and the Pharaoh Coins Win feature! Discover rich forgotten treasure of ancient Egypt in Netent‘s newest video slot, Coins of Egypt! This exciting 20-line game takes you to a temple which hides the coins and fortunes within its reels. Spin for your chance to unlock big rewards with wilds, free spins and the Pharaoh Coins Win feature! Wild Scarab Symbol – The golden scarab is the game’s wild and substitute for all symbols except the scatter, chest seal and collect symbols to complete wins. Pharaoh Coins Win Feature – In the main game, 1 to 3 coins with values ranging from 2 to 15x your bet appear on reels 1, 2 and 3 every spin. All coins visible during a round are collected and added to any winnings from the current round, irrespective of bet lines, when a collect symbol lands on reel 5. Free Spins Bonus – Free Spins are triggered when three scatter symbols appear on reels 1, 3 and 5. At the beginning of the free spins round, the total value of all coins present on the reels during the round that triggered the free spins is added to each chest. Up to three coins, one per reel, may appear on reels 1, 2 and 3 during each spin in free spins. There are three chest seal symbols corresponding to each chest that land only on reel 5. Up to one chest seal may be collected and added to its corresponding chest during each spin in free spins. Once three identical chest seals are collected by landing on reel 5, free spins end and the amount of coins present in the chest for which the three chest seals have been collected is awarded.